Ishi Ota [大田石]: 17 years of age, Ishi is a stern, self-reserved girl who attends Sakurakoga High School as a 2nd Year student. Typically very quiet, she keeps things to herself; not really barging into conversation. She speaks in a rather low, monotone voice, which makes everyone feel uncomfortable. While Ishi does look like an unapproachable person, she genuinely wants to get along with others. 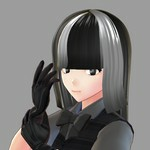 Her silent personality and cool appearance eventually led a few adoring students give her the title as "The Monochrome Princess". Can this model data be used by others?